Oakland police commissioners huddle with members of the Coalition for Police Accountability during last night's city council meeting. Three members of the Oakland Police Commission made an unusual appeal to the city council last night. 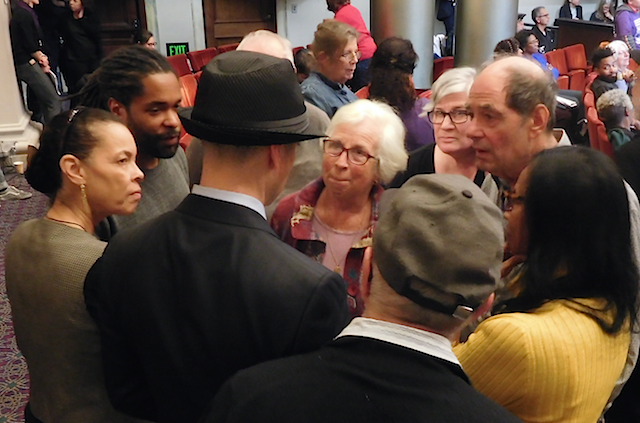 They asked councilmembers to hold off on voting on a policy revision because the civilian police commission's version of the new policy was excluded by the city administration in favor of a version drafted solely by the police. The policy revision in question regards the rules Oakland police officers are supposed to follow when they're deciding whether to search someone who is on probation or parole. Under the department's existing policy, officers are told they can always search someone who is on probation or parole. But this has been criticized as wasting officers' time, leading to racially disparate treatment, and creating distrust in the community. Earlier this year, the Oakland Police Department proposed a revision to the probation and parole search policy. OPD's new version informs officers that they don't automatically have to search someone just because they're on probation or parole. Instead, the officer is advised to consider the entire context of the stop and whether a search will advance the rehabilitative goals of probation and parole and ensure public safety. Ultimately, however, OPD's new version still gives officers discretion over whether to search someone who is on probation or parole. Oakland's police commissioners say OPD's revision doesn't go far enough in limiting officers' discretion. “The real modifications we did in the OPD version was simply, in most respects, to change a single word from should, that is discretionary, to must," Oakland Police Commissioner Jose Dorado explained to the city council last night during public comment on the item. The police commission's version would bar OPD officers from searching someone simply because that person is currently on probation or parole. Instead, the officer must have some type of reasonable suspicion that a crime has been committed in order to justify a search. "What is so difficult about a requirement to respect the city of Oakland and its residents?" Dorado said. Last month, OPD and Oakland's city administrator presented the police commission's version of the revised policy to the city council's public safety committee for possible adoption and recommended against the police commission's plan. Councilmember Abel Guillen, a member of the public safety committee, moved to advance the police department's version to the full city council. Police Commission Chair Thomas Lloyd Smith told the council last night it should consider the police commission's policy alongside OPD's and pick the better one. Under the city charter, the police commission has the authority to "propose changes, including modifications to the [police] Department’s proposed changes, to any policy, procedure, custom, or General Order of the Department[.]" If the police disagree with the commission's recommended policy, the city council has 120 days to vote on what the final policy will be. If the council takes no action, the commission's recommended changes are adopted. "They just high-jumped over the commission and went straight to public safety," Rashidah Grinage, a member of the Coalition for Police Accountability, said about the manner in which OPD's version of the new search policy was advanced to the city council for a vote instead of the police commission's. Larry White, another member of the Coalition for Police Accountability, called OPD's behavior an attempt to "end run around the police commission." After hearing from the commissioners, Councilmembers Rebecca Kaplan and Noel Gallo pulled the proposed search policy from last night's agenda so that the commission's version can be considered in addition to OPD's. The dueling versions will be discussed and possibly voted on at an extension of last night's city council meeting that is scheduled for Friday.